This improved variety of native baptisia has spikes of deep red-purple flowers, reminiscent of grapes. When it blooms in early summer, it attracts butterflies. 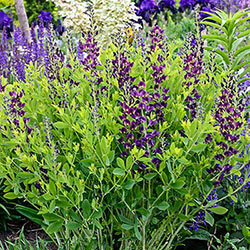 Growing just 30-36" tall, it's one of the most compact baptisia available. 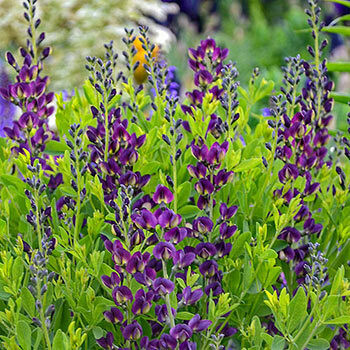 Long lived and drought tolerant, Grape Taffy Baptisia makes a good cut flower for dried and fresh floral arrangements. 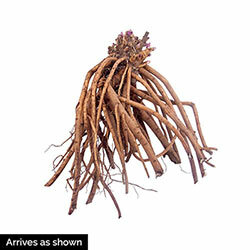 A low-maintenance perennial, it can even be used instead of a shrub in the landscape. It's also a good choice for meadow plantings, in back perennial borders and as a specimen plant in the flowerbed. Deer tend to avoid. Grows best in full sun to partial shade. Soil Requirements: Not particular about soil requirements.